While perusing the official website of the LDS Church I came upon their page defining the role of a prophet. I thought it’d be of interest for us to just take a look at what they say and see if we can glean any insight. God gave us a guideline in scripture how to tell a false prophet from a true prophet. He never did tell us that we can always trust a living prophet; rather He told us how to discern whether or not they’re speaking for Him. Secondly, their “inspired works” have changed 4,000 times in the Book of Mormon alone. Additionally, because many of the things they’ve prophesied over the years haven’t come to pass, they’ve been proven to be false prophets giving false prophecies. Where in scripture does God say to particularly obey the current prophet? What about Jesus’ warning that He is the only way to God? Thousands of people have left the “One True Church” and have lived a life filled with success in walking with the Lord. The Lord gave no such warning to His followers; this comes solely from the lips of Joseph Smith. In fact Jesus told the Pharisees that the two greatest laws were to love the Lord and your neighbor as yourself; this is known as Shema. We live and breathe following Jesus’ words, none other. 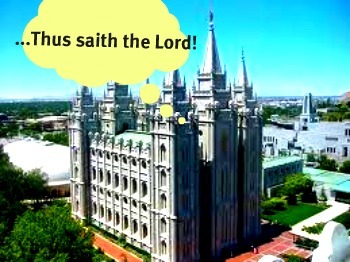 In light of that how do you explain the secret ceremonies taking place inside every single Mormon temple? Here again we find the Church using another passage of God’s word that they don’t sincerely believe, yet inserting some of its content for their own benefit. This comes from Matthew 16:18 when Jesus told Peter and the other disciples in Caesarea that nothing will come against His church – the body of Christ. Take heed my friend! Not one single thing they’ve presented in their descriptions of a prophet is correct. This is truly the sign of a false prophet, a false christ and false apostles! the lds church is a lye run by false prophets for money..we have learned the truth and left.free at last..
Accusses the LDS Church for not following the real Jesus Christ. God’s voice is not dead. He speaks! God has called prophets throughout the ages to help bring people to Christ. The LDS Church has prophets that lead and guide God’s work upon the Earth. Jesus came and gave us the final word (Love God with all your heart, soul, mind, and strength…and love your neighbor as yourself) through the Gospels. He also gave us the apostles to expound on that word through the rest of the New Testament.